Big Walnut’s Kegan Hienton (24) puts up a shot during the first half of Tuesday’s (Jan. 8) non-league showdown against visiting Westerville Central. SUNBURY – Junior Kegan Hienton appears to be moving in slow motion. The ball enters his hands and time slows down as he plots his next move. Unlike a slow-motion bullet in an action film, though, Hienton seems to find his mark. 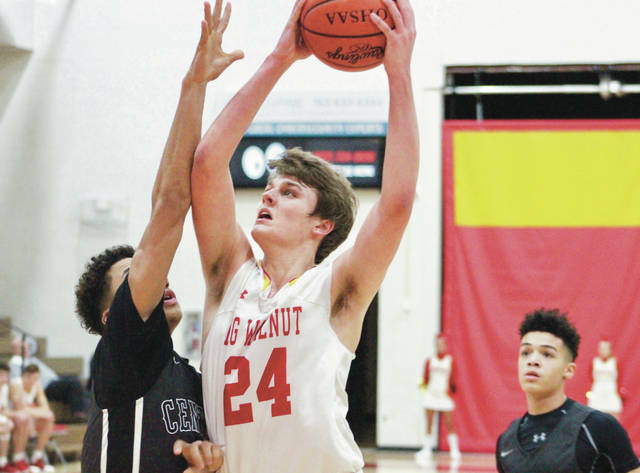 He went for 21 points, six rebounds three blocks and a couple of assists to lead the Big Walnut boys basketball team to a 60-48 win over Westerville Central in non-league play Tuesday night, Jan. 8. Hienton played all 23 games last season and averaged 9.7 points per game – behind only Brody Lawhun, who averaged 10.2 points per game over 11 games. Nathan Montgomery added 13 points and four assists, Lawhun chipped in 12 points, seven rebounds and four steals and Carson Becker pulled down 10 rebounds to lead the Golden Eagles (7-3), who have won four straight and five out of their last six as they seek their first winning season since going 12-10 in 2011-12. It took a little over four minutes for the Golden Eagles to get going – down four before a Lawhun and-one finally cracked the scoreboard. Hienton scored nine of the next 11 points as BW held Central scoreless for over six minutes in the first quarter. Jagger Barnett hit a three-pointer and Montgomery followed with a free throw to push the lead up to 20-6 with a little over five minutes left in the half. Central’s Tasos Cook scored seven points down the stretch to cut the deficit to six before Hienton scored to make it 26-18 at the break. Will LeMaire converted a three-point play and followed with a three to tie it 30-30 with 4:37 left in the third quarter. But Hienton found Lawhon for a three on the left wing on BW’s next possession and the Eagles never relinquished the lead again. Chaz Dixon had 13 points, eight rebounds and three assists; Cook added 10 points and LeMaire added nine points – all in the third quarter – for the Warhawks (4-7).